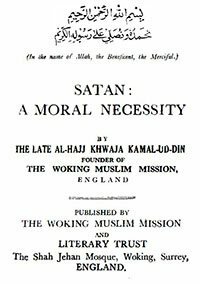 In this book, Khwaja Kamal-ud-Din discusses why Satan is needed to elevate the soul of humans. The world is full of antitheses because the process of creation and growth depends upon factors widely different. It begins to function when things of a conflicting nature come into contact with each other. Everything is potenti­ally good, but its kernel remains concealed, as it were, until it encounters something of a contrary nature to strike it free from its environments. The baser of its two ingredients in every combination consumes the dross of the higher and thereby reveals the kernel. There is always a great struggle in the process between the baser and the superior, and vitality results from making the superior immune from all further mishaps. By way of illustration, I would instance the struggle going on in man’s system to keep him alive. Nature has placed in our body an army of white cells, whose activities create in us the vitality which in the long run produces what medical science terms immunity against all factors of ill-health. The white cells are naturally sluggish, and to arouse them the introduction of some foreign element is needed. Toxins or poisons generally are introduced into our system from outside. The white cells at once begin to work against them, and the struggle increases their activity to such an extent as to create vitality. It improves our health, and if we set about attaining that object by the strict observance of hygienic laws we get the same result. The toxins then fail to affect the body. They become a sort of food for the white cells and tend to produce the said Immunity. If some extraneous poisonous matter must come into our body to make it healthy and keep it free from disease, we also need some poison on the moral plane to make us immune from sin. I do not say this by way of analogy because analogy is not always sound logic. I speak of the consistency of the law which pervades Nature. All laws of creation and growth work in the same way. They may assume the form of the particular matter in which they have to work—mineral, vegetable, animal or human—but the laws are the same. For example, things are born out of nothing; they are of very small size at their birth; they then grow gradually and reach maturity. When they have reached this stage they begin to decay and eventually become extinct. Similarly, toxins must appear on the moral plane to struggle with the principles of goodness and render them active. As the moral plane is the plane of consciousness, all its workers must possess cognition as distinct from passions. Our evil emotions cannot, therefore, in themselves, provide the moral poison for they would have to be possessed of knowledge—the knowledge of those passions which we are invited to abuse. If the body gives rise to a spirit in our system whose health depends on the exercise of good morals, some evil spirit is surely needed to remove all sluggishness from it. The evil one has been called Satan in religion. We do need his existence. He must work on wrong lines to keep the spirit of goodness ever active. Just as in Nature things become energetic when facing their antagonists, so do we need some enemy to arouse our moral forces which otherwise would remain, dormant. Thus Satan clearly ranks on the moral plane with the toxins of the physical plane. We find in the Quran the same func­tions assigned to him as are allotted to toxins in the physical kingdom. Like them he introduces himself within us from outside. He acts as an enemy, and weakens our sense of morality and tries to destroy it. But if our moral nature asserts itself strongly enough and we follow the laws of God we become immune from all sin. The Devil, then, like toxins, subserves a moral end. The two poisons, I mean toxins and Satan, assail our health and spirit on identical lines. Evil works on the some lines as those adopted by Satan according to the description of the Quran. They are, indeed, one and the same. The only thing left to decide is whether it is the perversity of our own mind that we call Satan or is it some personality existent in the external world who invites the mind to evil. In other words, is Satan a mere faculty or a being who inspires us to use our faculties for evil? He cannot be a part physical nature. If good morals depend on the activity of the spirit, there must be some spirit also to energise it in the struggle. Satan must be the Evil Spirit. There is, however, a further problem, which is to locate Satan. Is he an external entity or some­thing from within that causes evil promptings? The question in fact presents the same difficulty as that which stands in the way of the Theists in the matter of the acceptance of Divine Revelation as coming from without. Inspira­tion may be good or evil, it has in it nothing of a physical nature. It is a kind of knowledge, and no knowledge is born within us. Knowledge always comes from the outer world, and we receive, all our inspiration from things external. So it must be that the Archfiend, the inspirer of all evil, is really an external agent.